This event will feature advice on how SMEs need to manage risk in the digital business environment. 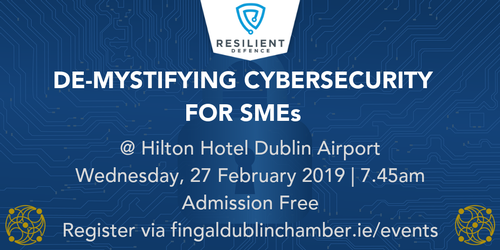 The event is for professionals from all sectors in Fingal and is ideally suited to business owners and managers in small and medium enterprises that are seeking to protect their businesses. Resilient Defence Director of Business Development, Dave Hammond will speak about the business challenges facing SME’s and the emerging threats and vulnerabilities of doing business in a more mobile digital world. There will be plenty of opportunities to ask questions, network with others and learn more about Resilient Defence. Attendees will leave informed of the main cyber issues and challenges facing SMEs, and how they can take simple steps to prevent scams affecting them and their businesses. - Please note limited places are available. Register early to avoid disappointment.